Crossfire II 3-12x56 AO is rated 4.8 out of 5 by 31. Subtension detail for Crossfire II 3-12x56 AO Hog Hunter riflescope with V-Brite illuminated reticle. Rated 5 out of 5 by Paul from Awesome Durability I mounted this scope on my AR 6.8SPC II. I went on a hog hunt last weekend in West Texas, killed 1st hog Friday night. Then on Saturday afternoon while driving over some really rough terrain my rifle was ejected from the UTV right into a pile of rocks, went back to camp to test fire and was in disbelief, the scope was dead on. I went out and took another hog right at dark thanks to the lighted reticle. Thanks for building a great scope at a great price! Rated 5 out of 5 by OleCowboy from Why no marketing comments on 1 star rating Just ready to hit buy a Vortex hog 56mm when I saw a review by Roger a military guy in Germany with 1 star a month ago in Dec 2017. (Rachel in marketing commented on another review 7 days ago). Vortex needs to comment as to what action is or was taken or being worked. Having been an active duty in Germany it is difficult to get company's attention, so Vortex needs to address his issues or explain in a comment why only his email comment and no followup explanation. Am very happy with my Vortex PST ffp and am ready to buy another Vortex product when Roger's issues or explanation GI overseas complication us resolved or properly addressed. Rated 5 out of 5 by CrazyGreek6977 from Awesome Scope for the money! I bought this scope to mount on my Springfield Armory M1A and am very satisfied with the looks and with the performance of this scope. It lives up to all that it is advertised....very clear optic in low light situations and it is very rugged as it has taken a good amount of abuse with the usual knocks that come from traveling in the field. I would recommend this scope to anyone looking for a great optic at a very affordable price. Thanks Vortex! You've really hit it outta the park with the Hoghunter! Rated 5 out of 5 by Sputnik66 from Perfect for those Porkie Pigs! Got it mounted last weekend on my New Tikka CTR .308. was on paper without a bore sight at 50 yds, and man can you see everything with it. I had a group a pigs out at 200 yds, in high grass, and I could see the momma pig and all 5 of the babies she had with her... The illuminated cross hair will be great for those late evening /night shots where those pesky pigs sneak up at dusk. Rated 5 out of 5 by Fitz from Awesome scope for hunting. The amount of light is awesome. I use the scope to mostly hunt deer. I have a Viper PST 6-24x50, which is awesome for the range and finally shot a 0.1 MOA on my 30-06 with it. I put the Hog Hunter on my DPMS AR-10 .308 and average just about 1 MOA using Federal Match Grade 168gr, which was about the same when I had my PST on the AR-10. If I could load my bullets I am sure I could beat it due to the 1/4" jump but they wouldn't fit into the mag. I just wanted a scope I could shoot before dawn, after dusk, close and long range and through some mountain mist. I have a 16" barrel; therefore, my bullets go sub-sonic just after 800 yards so the 12X is more than enough. This Vortex is great for the job not to mention the price and a life time warranty. I spent several days looking for a scope of this quality having a 30mm tube with 56mm objective and nothing came close unless I wanted to spend $1000 and up. Happy Hunting Y'all. Rated 5 out of 5 by dzsmith from decent scope, no complaints yet best in class when comparing to other scopes in its price range. glass is good, not the best, but lets be honest its a Chinese made lower triple diget price scope. its as good as it gets for the money. I bought it on sale, so for what I paid...it is by far the best illuminated scope ive seen. only complaint I have is there are no scope caps for it.....which is actually a big deal to me, but its not the scopes fault so I cannot apply it to the review score. 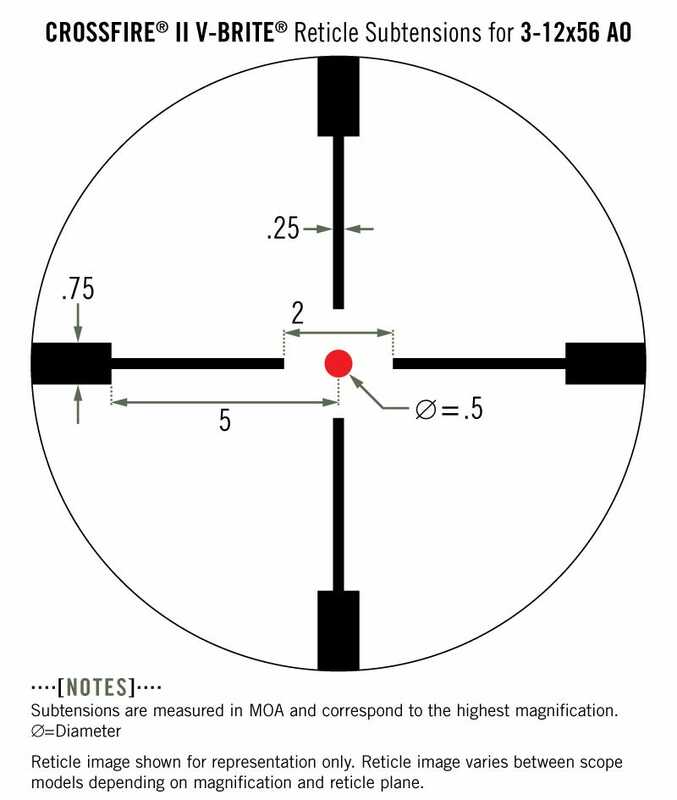 the scope I originally wanted was discontinues a viper 4-16x50 30mm tube, but with no fancy turrets .....they no longer make a scope of this size outside the crossfire series without all the fancy turrets....you simply don't need that for whitetail and its getting difficult to but high scopes without them. so I settled for the crossfire 3-12x56....ill admit I was skeptical about buying a cheap scope, but I have been pleasantly surprised. 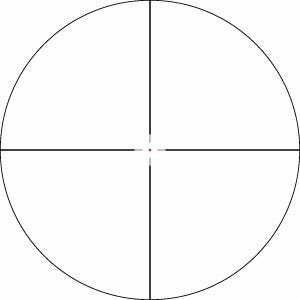 any 0-300 yard deer hunter should consider this scope before spending big digets. I haven't used this scope yet other than sighting it in, so well will have to see how it weather in the next few year. the biggest problem ive experienced with most scopes is they are great the first couple of years, then the gas leaks out and they fog up, and they eventually become blurry at full power. I will write a review in a few years to update my opinion but as of now. it appears to be a superior product. Rated 5 out of 5 by Matt C from Another great Vortex product! I bought this as a backup scope for my Remington 7mm mag and after mounting it to my rifle to zero it, I have decided that it is worthy of much more. Vortex has managed to create another optic that is easily competitive with the more expensive and longer established companies out there. Every Vortex scope I have purchased, including this one, has such a clear and crisp view, that it amazes me how they can offer their products for a portion of the cost of the other companies out there. Hats off to Vortex from the little guy who works hard for the money spent on hunting gear!! !